of 3554 vacancies for the posts of Group C & D as Stenographer, Junior Assistant, Operator, Process Server, Peon, Watchman & Other. 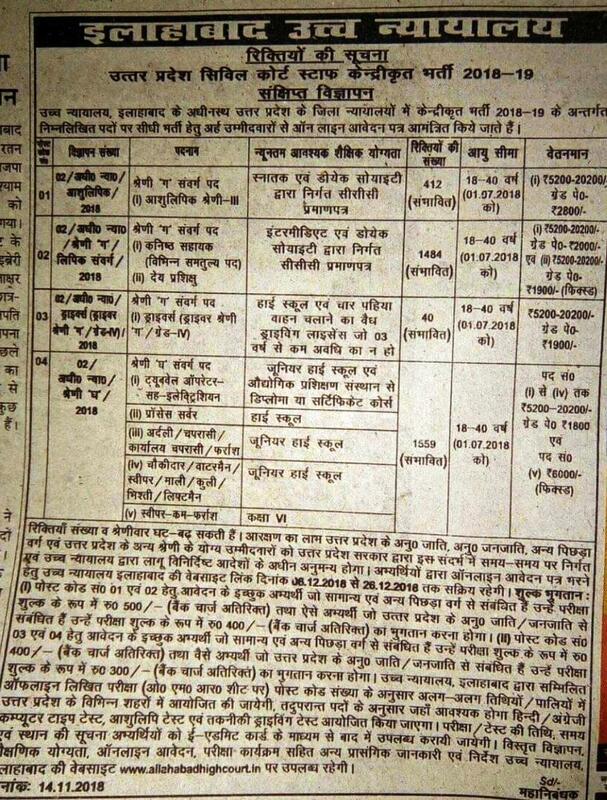 These positions are offered now by Allahabad High Court to all eligible Indians. Required degree or diploma having job seekers may apply online on or before final date. Online Application forms are invited from education and suitable participants for the recruitment of current openings. Dear aspirants if you are applying for this this chance of recruitment then you must have required eligibilities with experience related to position. Application form link is available on the official website of Allahabad High Court. Information related to conditions of apply for Allahabad High Court Recruitment is published for all candidates on this web page, so please read complete post. Applicants after appointment will get good pay scale with attractive Grade Pay per month. Best of luck to all dedicated candidates for these posts so that that may apply latest by closing date that is 26 December 2018. To get more news of jobs from Allahabad High Court you are advised to visit the official website of this organization which is allahabadhighcourt.in. For more news updates of jobs from ejobhub make bookmark this page through ctrl+D. Hey friends this is that opportunity for which you were waiting for your bright future. Age Limitation: 18 years to 40 years. Selection Method: Candidates will be selected on the basis of performance in exam and Viva Voce Test (Interview) Performance. No Travelling Allowance or Dearness Allowance will be refunded to applicants for attending test or interview. Application Fee Details - Candidates have to pay a fixed amount of application fee by category wise Rs. 500, 400 & 300. for more details visit official site. First of all visit the official website of Allahabad High Court which is www.allahabadhighcourt.in. On the home page enter on link as ‘Recruitment’. Read complete notification carefully and enter on “Apply Online” link. Upload digital images of vital testimonials and photographs (if required). After that must submit application form by pressing submit button. At last, take a print out of it in hard copy to show at the time of interview.